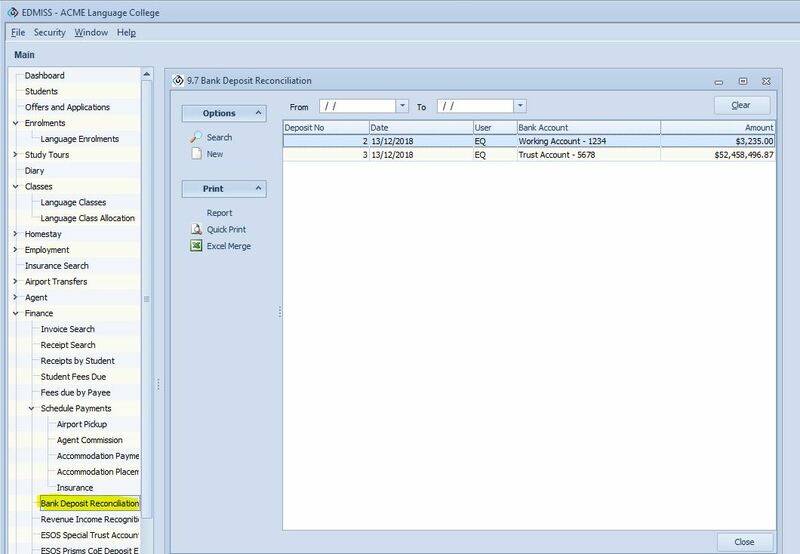 eBECAS Financials allows colleges to keep track of fees that need to be paid to the college for student courses and services. The module also enables colleges to schedule payments to accommodation providers, insurance providers, airport transfer providers and agents for their commission payments. eBECAS includes detailed financial reporting. This can be used to calculate income during a period. All reports have the option to be saved as a PDF file, or exported to excel which can be used for later reference or to send to external service providers. The purpose of this section of the manual is to provide you with assistance in entering fees that need to be paid to the College for student courses and services. Fees are paid by students and their agents and have the option to be paid in full or part payments, which is set up in the student account. This section of the manual will also provide assistance with receipts, reconcile banking and scheduling payments. eBECAS also includes financial reporting, which allows you to calculate income earned during a period as well as earned on sale. Financial reports are available within eBECAS that allow colleges to measure financial performance on either a cash or accrual basis. Accrual accounting is considered to be the standard accounting practice for most organisations who earn fees over a period. Equator IT suggests that accrual accounting is the most appropriate way to measure revenue. Cash accounting tracks the actual money that is coming in and out of your college. For example, if you use cash account and send an invoice for payment to a student or agent, you don’t record that the money has been received until you actually receive it. By using accrual accounting, you are recording expenses and sales when invoices are first issued. Events are recognized in financials regardless of when cash transactions actually occur. This method of accounting allows you to track the amounts your college owes to people and the amounts owing to you. Accrual accounting matches revenues to expenses when transactions are due and whether or not payments have been made. This method provides a more accurate picture of the college’s current financial position. Equator IT has designed eBECAS so that an offer is a “maybe” and is completely flexible. An offer has no attached debtor account. An accepted offer, which generates an enrolment, is a “definite” and has financial consequences. An enrolment has invoices with fees for service and the student will be placed in a waiting list for class placement. The enrolment invoices are included in the debtors (accounts receivable) listings. An offer does not impact financials; it is a tool for marketing and sales. An offer is a document detailing prices and services offered to students and agents. Within the system, offers are totally flexible. Any detail within an offer can be changed, including fees, discounts, charges, courses, start date and length. An offer does not impact financials (you do not create an invoice or have fees due). It is just a means of preparing and negotiating a potential contract, which does not become a contract for service until it is ‘accepted’. Until this point, an offer does not allow a student to be placed in a class, reserve a homestay placement or book an airport transfer. An enrolment is a contract for service. 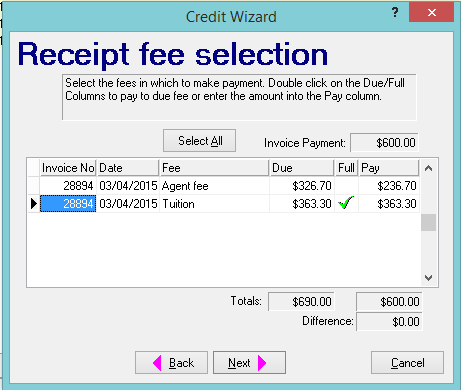 When an offer is accepted and enrolment generated, invoices will be generated. 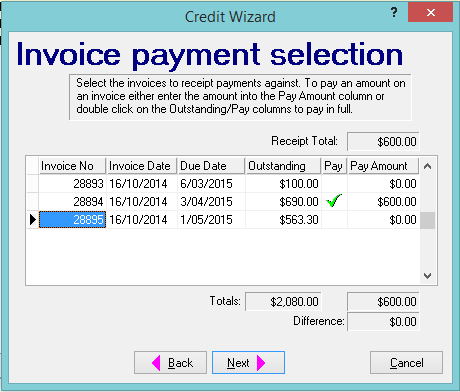 Extra invoices can be added but once an invoice is generated, it cannot be deleted. The course date however, can be adjusted. For every enrolment, this is legal contract between the college and the student. 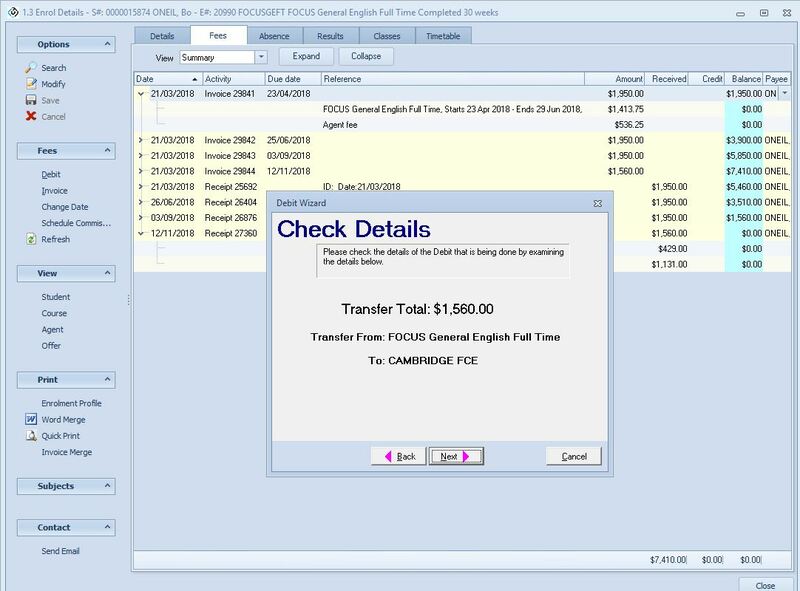 All invoices are recorded in eBECAS within the students account and in the receivables ledger. 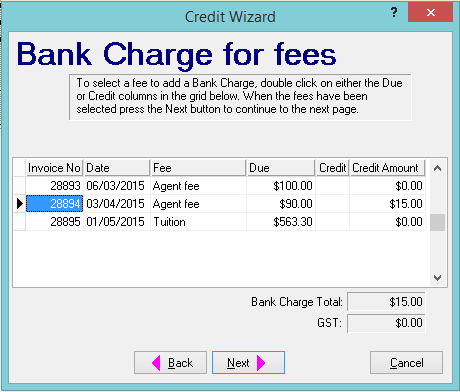 Other financial transactions (payments, receipts, refunds) are also recorded in the fees tab of the enrolment details window. A complete history of financials must be kept – including who, when, where and why. The original contract and transactions must be accessible for the student, agent and users of eBECAS. There can be no short cuts when it comes to changes of course, length, agent, discounts, credits and debits of fees. All alterations must have an audit trail. Any invoice (for an accepted enrolment) generated in eBECAS is a contract and therefore needs to be treated like one. Any course changes or alterations to the fees due to be paid must be documented. Pro forma invoices are generated initially as offers. When an offer is accepted, the system generates an invoice for service (see How do I enter an Offer). An invoice is a legally enforceable list of fees due to be paid. The invoice is automatically date and time stamped when it is created, this becomes the invoice date. 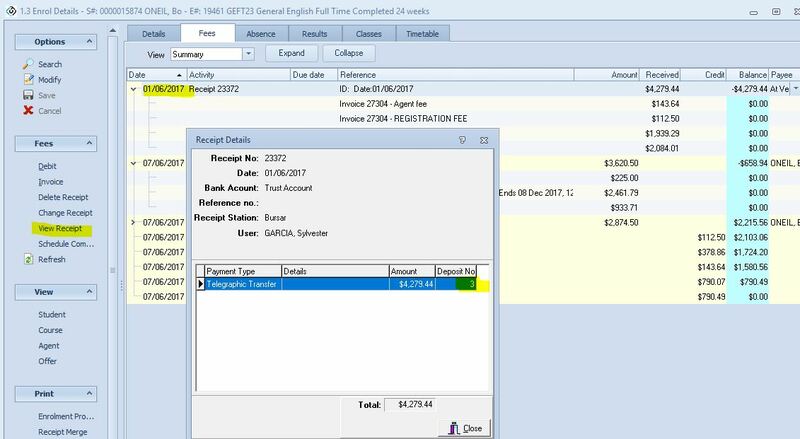 The date the invoice is due to be paid is separate from the invoice date. 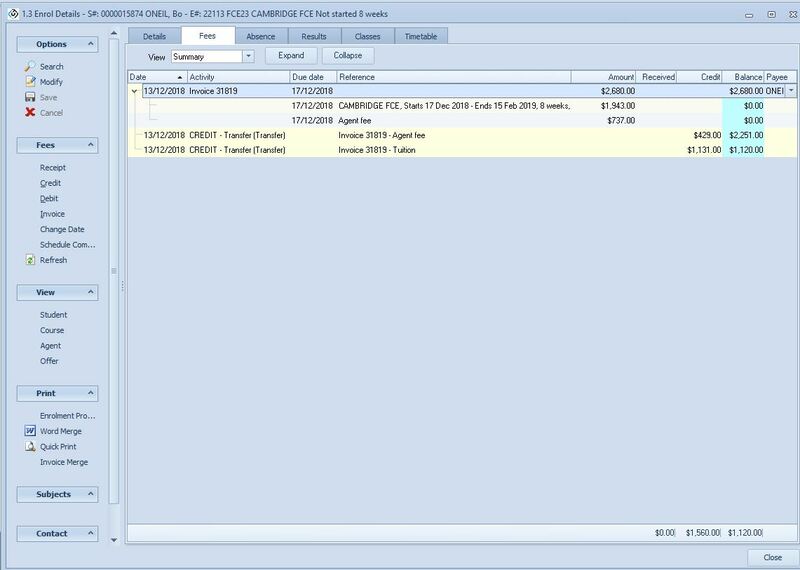 The invoice date can be changed from the Invoice View Summary screen. 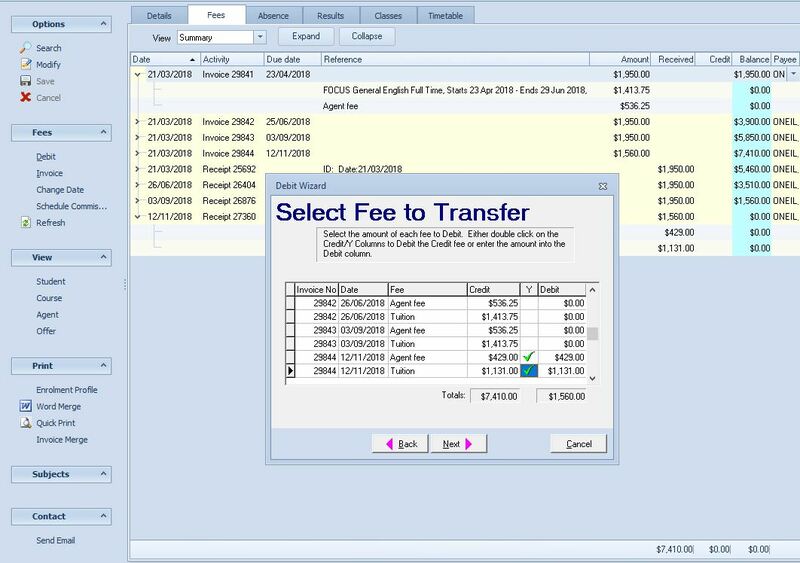 To change the invoice Due date, select View Invoices. 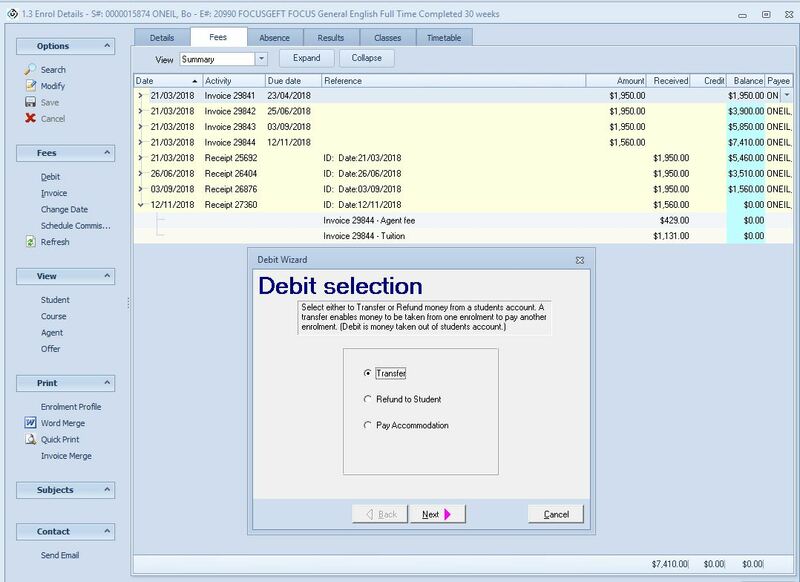 From the invoice display, the due date can be changed by selecting the invoice line item and clicking “Change Due” on the left hand panel. 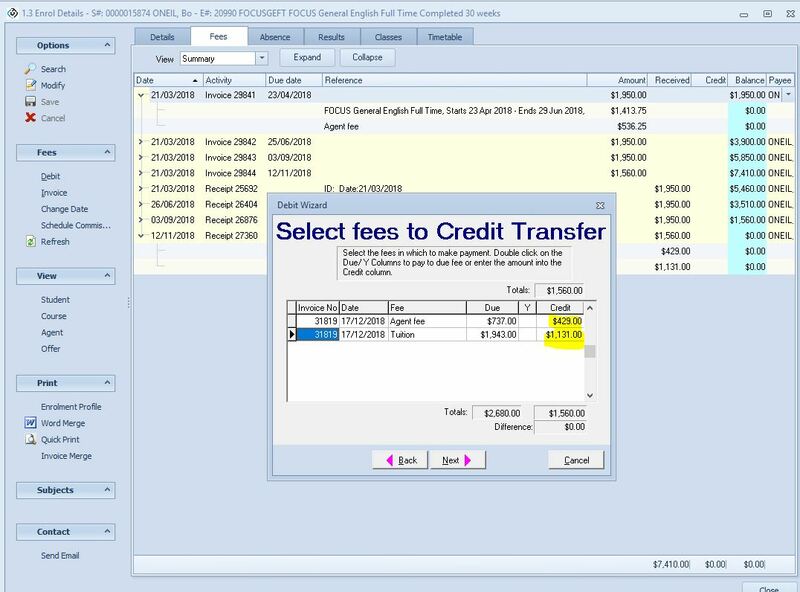 Back on the View Summary display, if no fees have been credited or receipted, you can specify a new payment schedule for all or part of the fees. To do this, please select the Fees Schedule option on the left hand panel. 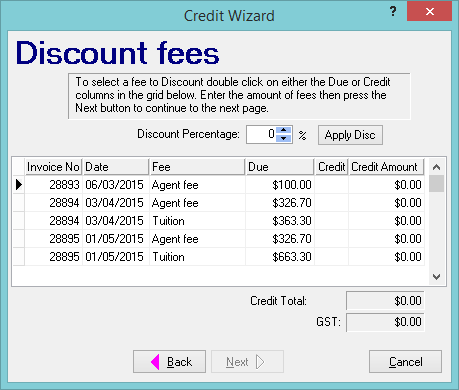 This will bring up a wizard (below), which will enable you to re-specify the fee payments. When you are entering a receipt, it is important to remember that you are receipting the exact money that you have received. It does not matter if you receive more or less money than what is invoiced. Whatever amount is paid to the college is the amount that you receipt in EDMISS. To enter a receipt, select Receipt from the Fees menu on the left hand panel. This will display the Receipt Wizard. When you enter the details (whatever you actually receive), press TAB to move to the the Next button. 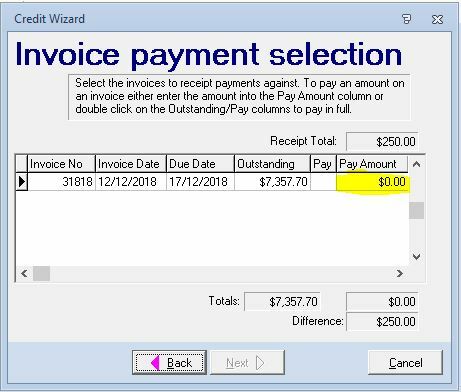 If you are receipting an amount less than the total, specify how much you are receipting against what invoice (you can pay across multiple invoices for the same the enrolment. Press next, and then Finish. In the Fees tab of the Enrolment details, there is now a receipt for $250. Don’t forget to reconcile your banking. To do this, go to Banking Deposits. A credit is a payment that has not been received for an invoiced fee. The credit types in eBECAS are Discount fee, Write-off fee, Currency Fluctuation, Bank Charge and Credit – Agent fee. A discount can be applied as a percentage or a fixed value. If a discount is applied to the tuition fee, then the same discount percentage value should be applied to the agent fee. If the fee includes a GST portion, the GST value will also be credited. A discount is typically a reduction in the charged rate. If you are to completely discount the fee, this would be better identified as a write-off. Writing off a fee means that the fee is no longer due for payment. When a fee is written off, the intention is that the fee will not be received and will not be recovered. You can only completely write off the fee, otherwise you should be using discounting for a partial write-off. For example you can write off a enrolment fee. Note – there is a separate option to Credit an agent fee when you receipt the tuition portion (nett) and the agent keeps the commission – see below. In eBECAS, we receipt by fee. Sometimes fees are not paid in their entirety due to currency fluctuation or bank charges. If this ever happens, you can identify the fee as no longer needing to be paid or as outstanding and still due. Below is an example of this, where the total outstanding student fees is $690 and the amount received via direct deposit is $600. In the credit wizard, first enter the receipt amount. You must then specify the amount being paid and against which invoice (there can be multiple invoices to pay). You can only click the next button when the amount receipted matches the total paid against the invoice(s). We recommended you assign the outstanding fee against a non-course fee (not related to tuition and agent). In this example, an outstanding $15 is added to the Agent fee. 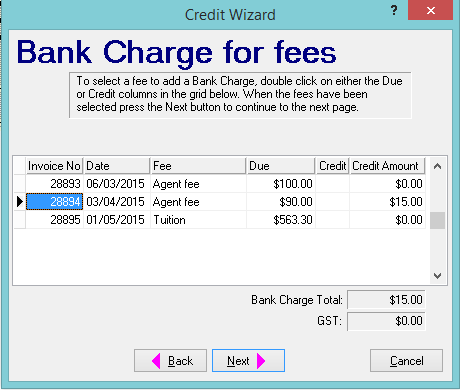 Press next and finish to display the updated fees tab in the Enrolment details. The outstanding $15 will need to be identified as a bank charge. 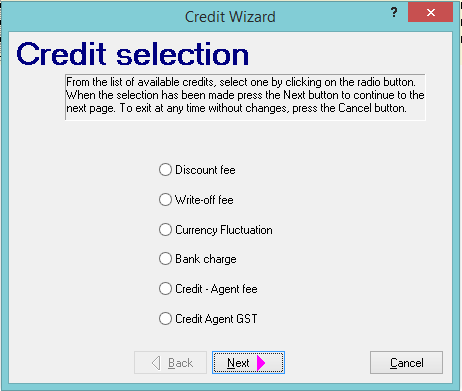 To do this, select credit from the left hand panel, and then select Bank charge. In eBECAS, the course cost is always listed as the gross fee, which is what the student pays. This is specified for each Course from Main – Utilities – Courses. The course cost is always displayed as two separate items: tuition fee and agent fee (commission). The course cost therefore = tuition fee + agent fee. Agent commissions are a fixed value or percentage of course cost. Agent commissions are specified in the agent section Main – Agent – Agent Details – Commission. You can have different commission rates for each agent by faculty (grouped courses). An offer is a pro-forma invoice. 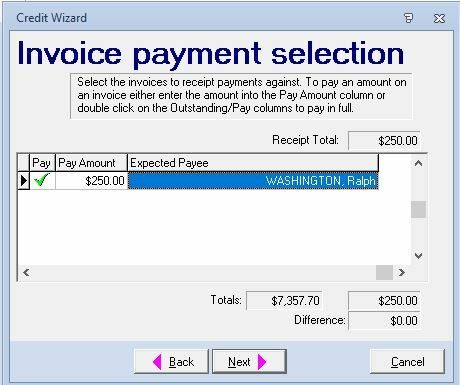 You can use Microsoft Word templates to generate pro-forma invoices. If a pro-forma invoice is sent to an agent, then the course cost is usually shows the agent commission. 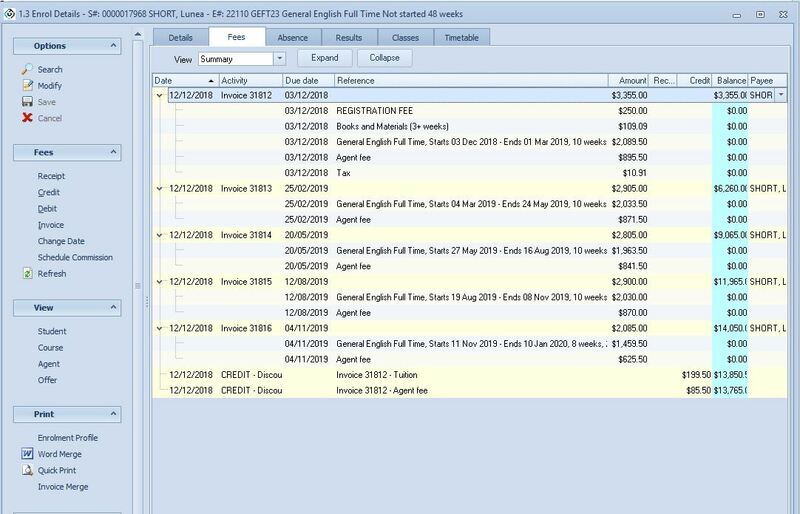 You can have several templates displaying pro-forma invoices gross or nett. 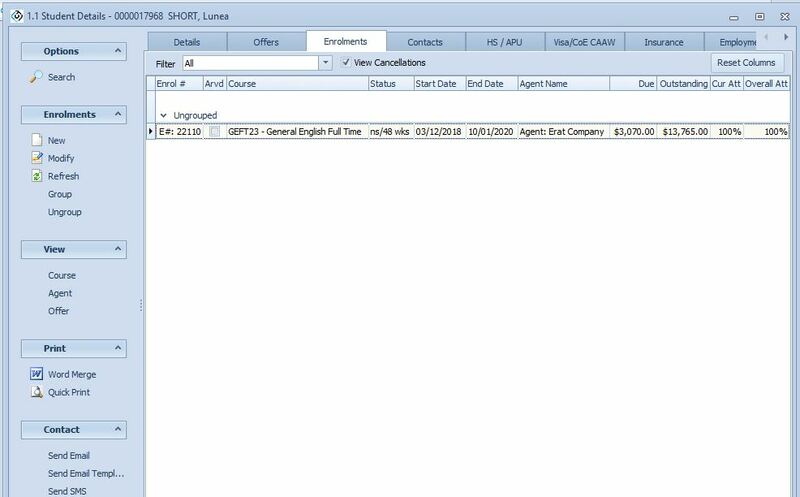 Usually a pro-forma invoice is also sent to the student, displaying only the total course cost with no agent fee displayed. 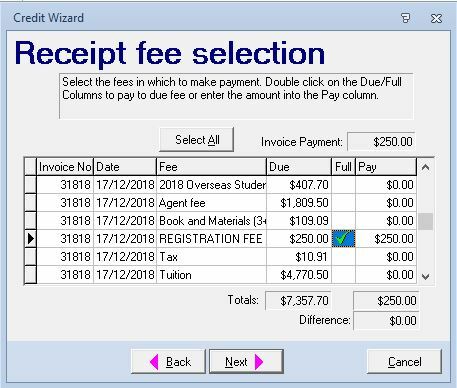 The display of course fees in the Enrolment Fees screen, shows separate tuition and agent fees, never the less you can print the pro-forma invoice nett or gross. Please wait until the tuition fee is paid to verify if the commission is credited or receipted. Our experience is that while you may invoice nett, the agent could still pay gross. We encourage Colleges to wait until the tuition and/or agent fees are received before crediting the agent fee. To correctly print the gross receipt of a nett fee payment the date of the tuition payment must always be the same date as the credit of the agent fee. Please do not credit the agent fee until you receive the tuition fee payment. The date the tuition fee is paid (if paid nett) should also be the date the agent fee is credited. In eBECAS, Agent commissions should include the agent invoiced GST. In the agent details, if the agent is local to Australia, then the agent should be marked as local their ABN number should be added. The commission rate should include the GST component. If the standard commission rate is 20% and the College agrees to pay the additional 10% GST on top of the commission, then the rate should be 22%. This is the percentage of the course cost you have agreed to let the agent keep. We suggest that to avoid confusion, colleges have a separate Microsoft Word template for local agents that includes a line specifying that the GST is included and needs to be forwarded to the tax office. You need to be aware of what GST you have paid, this can be accessed in the invoices and by viewing the ‘Debits in period’ reports. 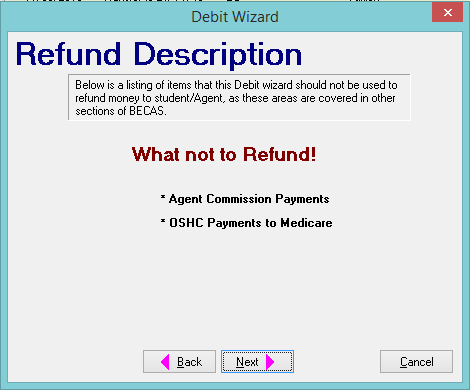 eBECAS allows you to make un-expected payments such as refunds and transfers. A separate area in eBECAS – Main – Finance – Scheduled payments should be used for expected payments such as Homestay scheduled payments, scheduled payments for Insurance, scheduled payments for airport transfers and agent fee commission refunds when the agent pays gross. 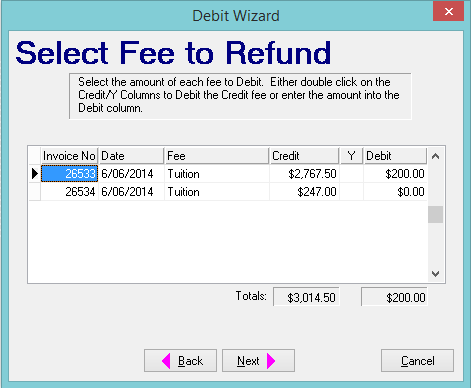 From the fees tab of the Enrolment details, select the debit option from the left hand panel. 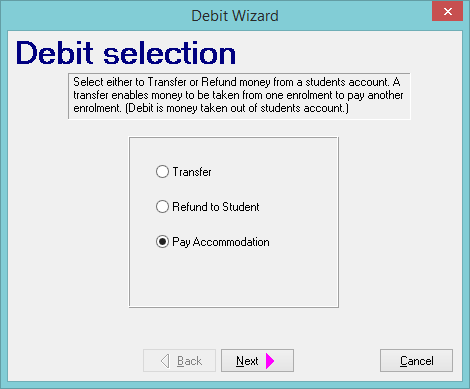 This will launch a debit wizard with the options Transfers, Refund to Student and Pay Accommodation. After an offer is accepted, the enrolment is created and student can be assigned to class/es and invoice/s are raised. A student may subsequently decide to study a different course and cancels the course (cancel = does not attend any part of the course) or may shorten the existing course and transfer the fees already paid to the new course. Please refer to the manual for details about changes under Admissions. If the original course length needs to be shortened or cancelled, this does not effect the fees. This area of the manual shows you how to transfer the fees. A transfer is transferring the payments of fees for the same student, from one Enrolment to another Enrolment. If a course is shortened or cancelled and the fees have already been receipted, then these receipted fees can be transferred to another enrolment for the same student. Go to the Student – Enrolments tab. For this worked example the student is up to 30 weeks of their 38 week course. The student has decided they want to shorten the course and finish the 30 week course and enrol in a new Cambridge First Certificate course. First, ensure the new enrolment has been created. 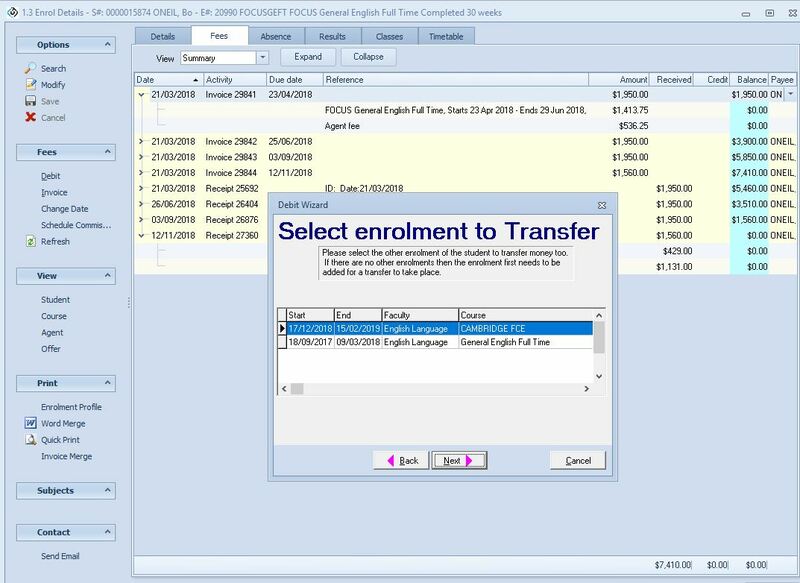 Go to the enrolment detail to shorten (or cancel) the original enrolment from Details screen with the Extension / Change button. The Student enrolments are now listed like this. Now go back to the Fee details of the shortened course, press Debit, and select Transfer. The fees that have been invoiced with the enrolment are displayed. You can select which fees and the amount of those fees that you want to transfer. The weekly value is $195. The commission rate is 27.5% The 8 week value needs to be transferred a total of $195 x 8 weeks = $1560 which is is broken down into tuition $1,131 and agent fee $429 from one enrolment to another. Select the fees and invoice that will be transferred. Press next. Select the enrolment that the fees will be transferred to. Then, select the fees to Credit Transfer – make sure the agent and tuition fees are allocated proportionally and correctly. Finally, you will be asked to check the details of the transfer. A fee can be refunded to a student if a fee has been paid and the fee has not previously been refunded. 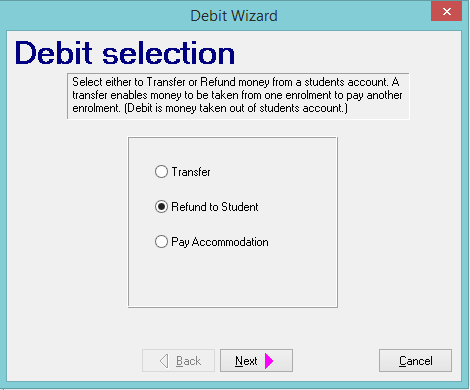 This option is designed to refund student fees. We do not calculate this automatically when shortening a course. It is entirely at the College’s discretion what fees and how much to refund. The below screen exists to remind you what not to use this facility for. Agent commissions when invoices are paid gross, these should be paid via Scheduled Fees – Agent Commission. Similarly, any Scheduled fee should be paid via the Scheduled fee area. Please see the next section – Scheduled Payments see here. You can choose what fee and how much to refund. You can use the “Pay Accommodation” option to pay a homestay provider. While this option is designed to make a payment to an accommodation provider, we do NOT recommend using this facility to make homestay payments. Homestay payments should be scheduled when the placement is been made. 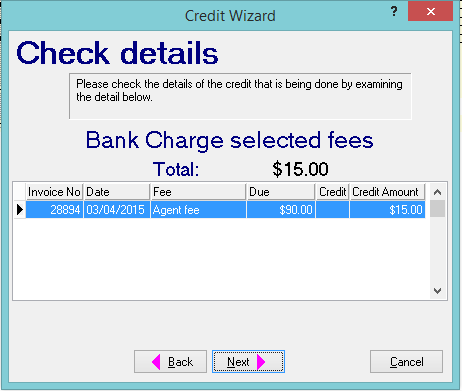 Using this debit wizard to make homestay payments requires you to remember when the payments are be made. If you use homestay scheduled payments, the system will remind you when these payments need to be made. The key benefit of using scheduled payments is that you do not need to remember or remind yourself when to make payments, as the system will prompt you when fees are due. To schedule payments to a homestay family for a placement see here. Banking Deposits enable you to reconcile the receipts made for each bank account. Once the reconciliation has been made, the receipt cannot be deleted. You can check if a receipt has been reconciled by viewing the student receipt. If the receipt has been reconciled, the student receipt will have a deposit number. You can view all the deposits from eBECAS – Main – Finance – Bank Deposit Reconciliation. You can search for deposits in history or make a new deposit. To make a new deposit, press the New button. 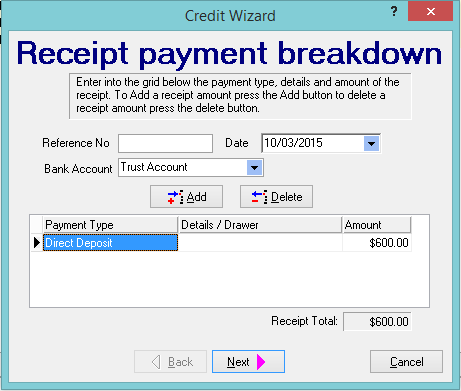 Select the bank account to reconcile, receipt station (deposit book) and payment type. 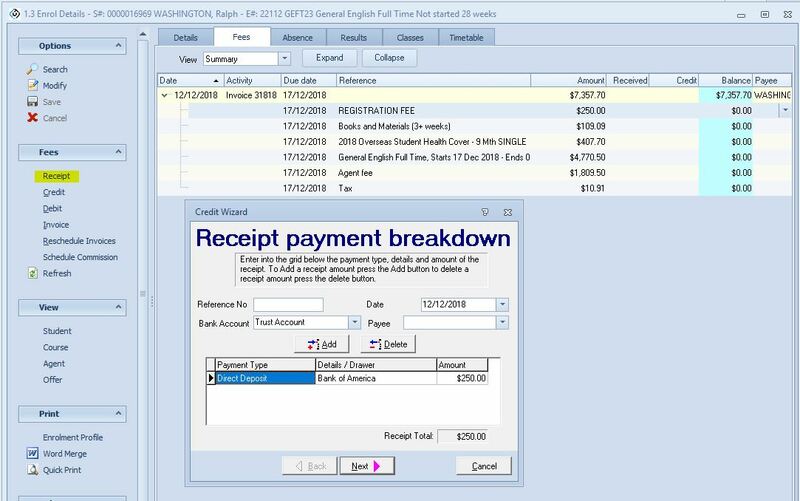 The unreconciled receipts and credits will be displayed, with the selected filters applied. Next, select the receipted fees and reconcile the bank deposits. 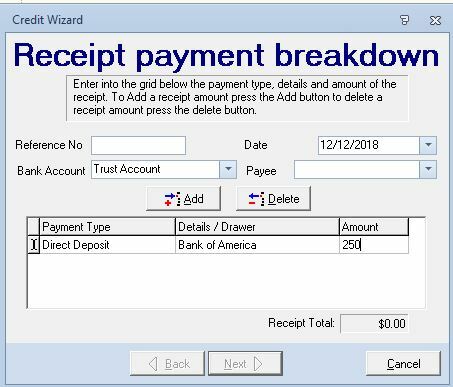 The deposit slip reconciliation of receipts entered into eBECAS will be displayed for printing or exported to spreadsheet. 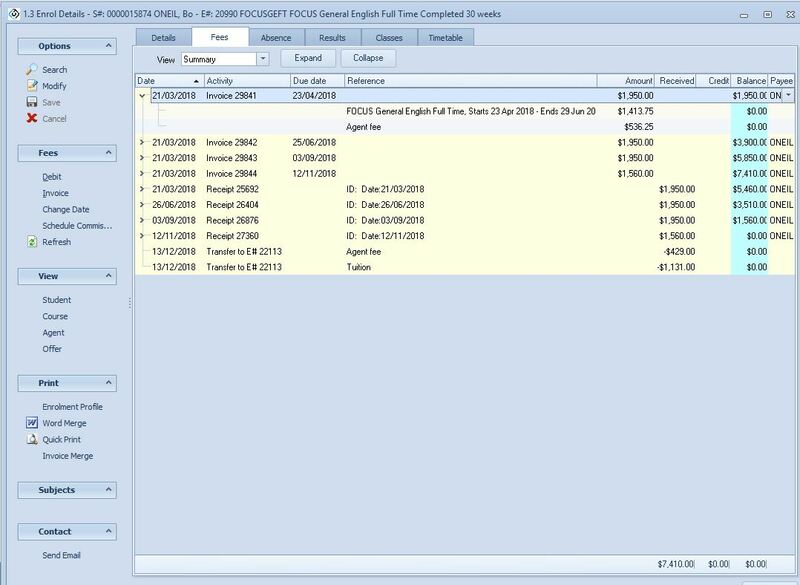 There are reports that can be printed and exported to spreadsheet (menu items under eBECAS – Reports) and also “reports” that are viewed in a displayed grid (menu items under eBECAS – Main). 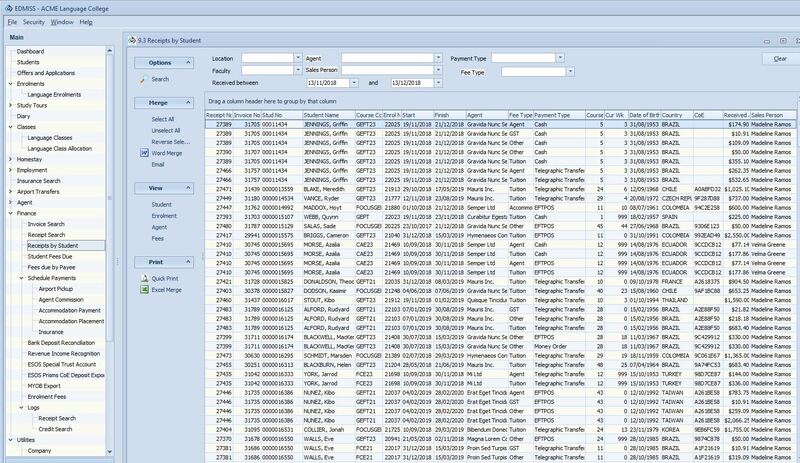 Grid searches and display enable you to select the columns you are interested in viewing and enable you to group and total flexibly. You can apply filters and complex queries in the grid for multiple columns. All grid displays have the option to export to spreadsheet. The Course Revenue Report, which separately lists both the tuition and agent fees earned during a period. Revenue by Start date. This report lists fees as revenue for students with an enrolment starting in a specified period. 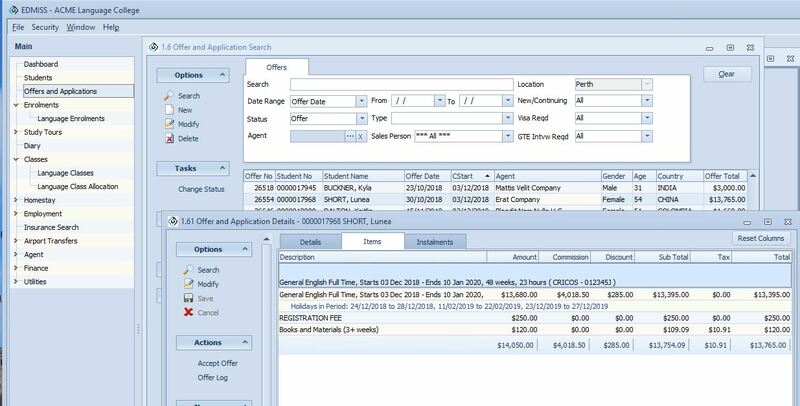 When generating these reports you can filter by fee type/s (tuition, Agent, Insurance, Accommodation Arrangement, Accommodation Payment, Airport Transfer and Other) to list totals by Company, Location, and Faculty etc. You can then use these reports to determine how you want to treat each fee. Remember that the figures from these reports (Course Revenue Report and Revenue by Start date report) will change as the student enrolment changes (start date & course length changes). 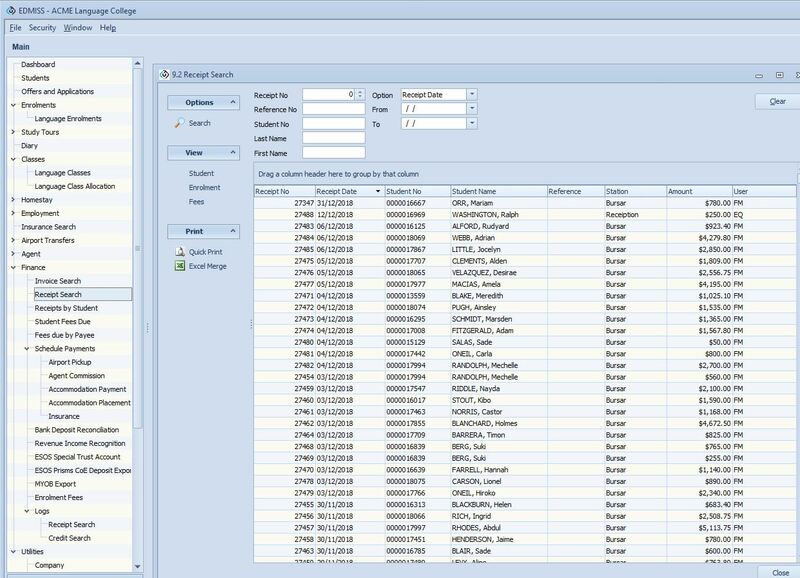 In this report, the information provided in each column separately relates to the specified period for that column. None of the information relates to the period of the homestay or course etc. Each report has a summary and detail option. The summary option provides sorted totals and the detail option allows you to see the student courses that the figures are from, for each column. You can also run other reports to access more details for each column in the financial activity report e.g. Invoice in Period report. When an enrolment is accepted and converted to an enrolment, an invoice is created for the course fees and any other services the student requires. These fees are automatically scheduled as due on the students start date. Alternatively, a payment schedule can be created. This will schedule part payments for any or all fees rather than having the fees due on the course start date. The Invoices due report lists invoiced fees that have not been paid as at a point in time. You can list fees due by a date, or outstanding based on start, current and finishing course enrolment dates. To list all fees filtered by enrolment date (starters, current or finishers) please select the All due option. The invoiced and due fees will then be listed by Company and Location and grouped by Faculty, Course, Agent and Country and also by Fee Type and Fee. The detailed option provides details by student and you can also apply a course filter (i.e all courses or one course). 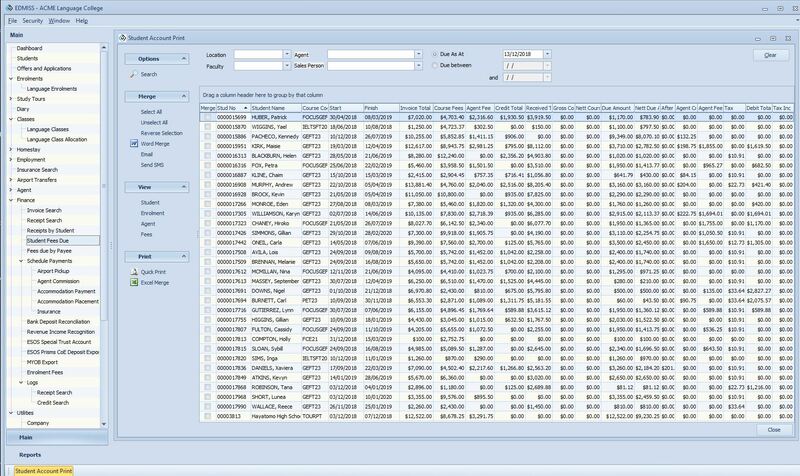 You can apply a fee type filter to select all or any combination of fee types to be included in the report. 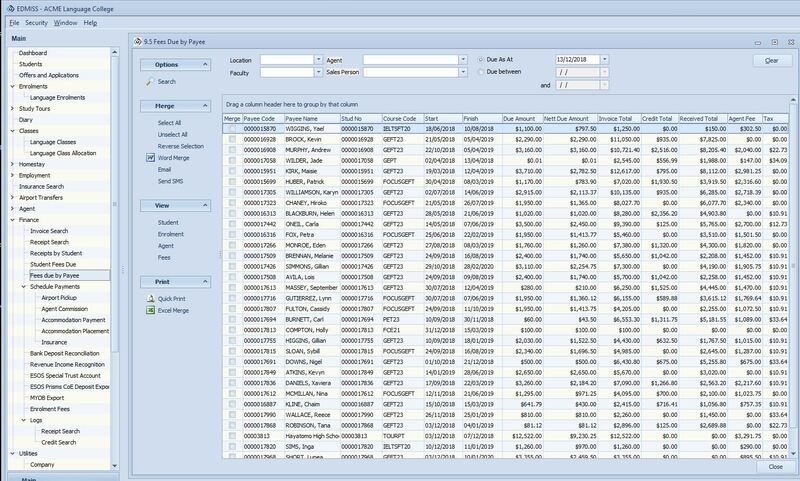 The option “detail with due date” is only included for instances where data is exported to Excel to be used in a pivot table. The Invoice in period report now includes the facility to filter by fee type/s (tuition, Agent, Insurance, Accommodation Arrangement, Accommodation Payment, Airport Transfer and Other). The summary provides you with a list and totals by Company and Location. This report is simply a listing of the invoicing activity during the period entered. It is useful for measuring admissions activity and as an indication of future revenue. However it does not include any credits within that period and as such may overstate the sales position of the business. The unearned fees report is what should be used to calculate the financial position of the student accounts for the services each student has requested. The only students that will appear on this report are current or future students. Fees can be specified as either course fees, other fees or homestay fees and are earned depending on the fee type. In the report, the course cost is separated into tuition and agent costs and earned daily i.e. A 10 week course at $200 per week with 20% commission would total $1600 for tuition costs and $400 for agent fees. The daily fees would be $1600 / (10 * 5) = $32 per day for tuition and $8 per day for agent fees. The Unearned Fee report is the most complex report in eBECAS. For a particular day, fees are calculated as Earned (revenue) or Unearned (held – trust). We provide several options to interpret how fees are to be calculated as earned. For the purpose of this report, if a student has completed their course, all of their fees have been earned and none remain unearned (although there may be fees that are unpaid). The primary filter in this report is by current, past and future student enrolments. The basis of the Unearned calculation is the fee type. Course cost (tuition and agent fee) is earned daily for the period the students are in attendance. The fees are earned in a week for 5 days only, Monday to Friday. Insurance fees, accommodation arrangement fees and airport transfer fees should all be earned on the course start date. Other fees can be marked as earned on the course start date or on the invoice date. Homestay fees can be marked as earned when they are paid to the homestay provider or earned on a weekly basis over the length of the course. This can be overruled if you schedule your homestay payments, in which case you can mark all scheduled payments as earned. Alternatively, you can specify that you have only earned the portion, which is the difference between what is collected from the student and what is paid to the homestay provider. If you have any questions regarding this, please first view the detailed fee breakdown for a particular student and trace them over a number of days. This will allow you to compare the fee details for different days and identify when fees are treated as earned. The report is grouped by company & location and you have the option to group by course, agent, country and none. The last page of the report is a summary of totals for all fee types and fees. The course revenue report was previously known as the earned revenue report but was renamed to more closely reflect where the revenue is generated. The report lists and calculates the tuition and agent fees earned in a period, from the current student enrolments. The report also calculates the proportion of the original invoice that becomes discounts and write-offs. Revenue is calculated based on the invoiced course cost only (tuition + agent fees) for a period. The calculation is based on the number of days that the student is in attendance for the period specified and takes into account faculty and student holidays. 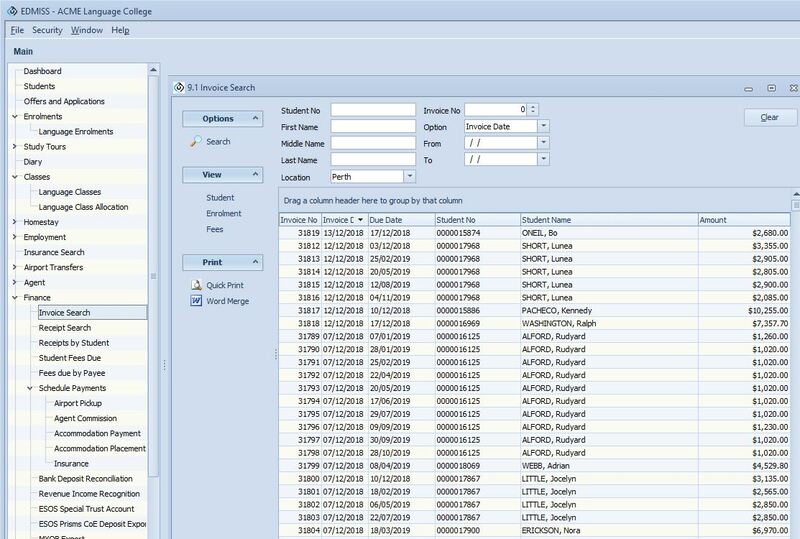 The report groups by Company and Location, you can select to also group by either faculty, Course, Agent or Country. You can filter and select all faculties or a single faculty. You can filter and select all courses or a single course. The details version of this report shows the above information by student course enrolment. The Income Recognition report is a new report and will likely change. It is designed to produce repeatable results regardless of changes to student enrolments. Results are stored and new values can be calculated from a pervious period. 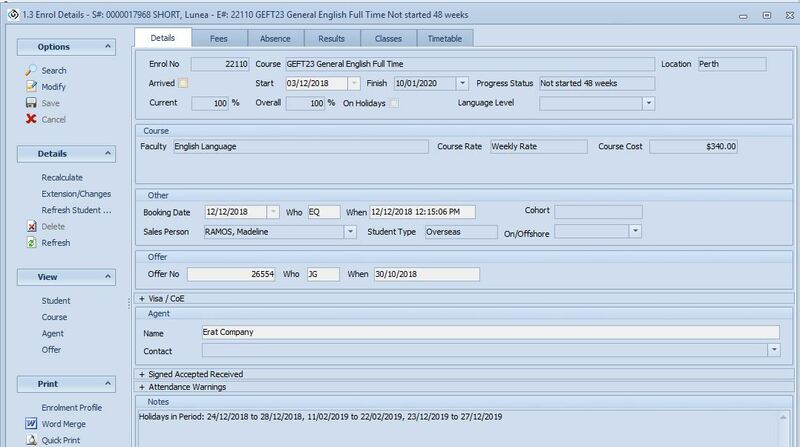 Initially, you will enter a period of time and the report will calculate the revenue for that period based on invoiced course cost only (tuition and agent fees). This calculation is based on the days the student is in attendance for that course in the specified period and takes into account faculty and student holidays.